In May of 2011, I had the chance to review a book called How Huge the Night. It was a fantastic book, by Lydia and Heather Munn. Taking place in France during early World War II, the book was a coming-of-age story about a French boy, Julien, that was well worth reading. Now, with Defy the Night, the mother-daughter writing team has done it again. This one is a fantastic coming-of-age story about Julien's younger sister, Magali. In the midst of war, one teenager is determined to make a difference. If no one will do anything, she'll have to do it herself. In 1941 France is still "free." But fifteen-year-old Magali is frustrated by the cruel irony of pretending life is normal when food is rationed, new clothes are a rarity, and most of her friends are refugees. And now the government is actually helping the Nazis. Someone has got to do something, but it seems like no one has the guts—until Paquerette arrives. Smuggling refugee children is Paquerette's job. And she asks Magali to help. Working with Paquerette is scary and exhausting, but Magali never doubts that it is the right thing to do. Until her brash actions put those she loves in danger. My thoughts: Wow. I don't even know where to start. Aside from the frustration of not being able to pronounce the names correctly in my head (I've never been able to grasp French pronunciation! ), this book was terrific. The entire novel is told from Magali's perspective, and that means you are inside her head, seeing things from her point of view. Particularly, you are seeing Magali from Magali's point of view. And boy, does she have some of the stereotypical, teenage idealism going for her. And the teenage invincibility. You can see it in the first sentence of the book description, "she'll have to do it herself." Magali matures dramatically in this story, and she learns a lot. She learns about fear, she learns about friendship, she learns about sacrifice. In the process, she is saving children from horrific lives in the internment camps. She also learns that there are many ways to make a difference, and while she may be the one taking the children out of the camps, she is certainly not the only person "saving" them. This is not a light, fun book. The subject matter is fairly intense, though I would imagine scenes of Jewish mothers handing their babies to total strangers is more traumatic for a mom than it is for a typical teen. And I suspect some of the teenage angst comes across differently to me as well. I can tell you that I finished the book, and handed it over to my 16-year-old (he is still 16, for another couple days! ), asked if he remembered How Huge the Night, and told him he has to read this one. Normally, I would hang onto the book at least until I got my review written. If you have boys, I'd recommend having them start with How Huge the Night as that one has more boy appeal. 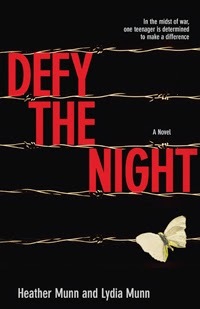 Once they know the characters, I think they will also really enjoy Defy the Night. Defy the Night does stand alone, but knowing the history of this town, and some of the people, will make Defy the Night an even better tale.